A new mission proposes using Charon to give a Pluto orbiter a (gravitational) boost. KNOXVILLE, Tenn. — It took decades to get a mission to fly past Pluto, but it may take less time for an orbiter to swing around the tiny world if a fuel-saving tour could help bring costs down. Researchers have determined that a future mission could use the dwarf planet's enormous moon, Charon, for gravitational boosts to save fuel, enabling extensive observations of the Pluto system and even allowing for a visit to another icy world in the outer solar system. "With this gravitational system, Charon can take a spacecraft out past Pluto and into the Kuiper Belt," planetary scientist Alan Stern told Space.com. Stern and his colleagues at the Southwest Research Institute investigated a variety of methods to expand an orbital mission of Pluto while bringing fuel requirements down. He presented the possibilities to his colleagues at the American Astronomical Society's annual Division for Planetary Sciences conference in Knoxville, Tennessee. In July 2015, NASA's New Horizons mission revealed Pluto in all its stunning glory. The spacecraft zipped by the dwarf planet, snapping images and collecting data without stopping in a whirlwind tour that raised even more questions about the most well-known dwarf planet, like how it can continue to have geological and surface activityunder such frigid conditions. A Pluto orbiter could take a closer look at the mysteries of Pluto and the handful of satellites that circle it. According to the new research, Charon is key to that endeavor. At almost half the size of its parent planet, Charon could provide the boost to make the most massive orbital corrections during the tour, much as Saturn's moon Titan did with NASA's Cassini mission. "We discovered we could do a complete orbital tour: Study all the satellites, dip down into the atmosphere … using Charon for gravity assists just like Cassini used Titan," Stern said. "It's almost a zero-fuel tour," he said, adding that fuel would only be required for small "clean-up maneuvers." Software lead Tiffany Finley demonstrated that the Pluto tour could thrive off of dozens of gravity assists from Charon. A spacecraft could zip by each of the four smaller moons at least five times, make an extensive close-up study of Charon, examine Pluto's polar and equatorial regions, and even sample part of the dwarf planet's atmosphere. All of this would be possible using an electric propulsion system similar to the one used by another NASA mission to a dwarf planet, Dawn, according to spaceflight engineer and mission designer Mark Tapley. Charon could even boost exploration of the Kuiper Belt, the field of ices and rocks at the edge of the solar system. By using the gravity of Pluto's largest moon, a spacecraft could leave one dwarf planet and hurl towards a second one, perhaps even stopping for a visit. "We found it is even possible to reach and then enter into orbit around a second dwarf planet in the Kuiper Belt after studying Pluto," Tapley said in a statement about the work. Possible targets included several known dwarf planets. Stern said an orbiter could thrive for years around Pluto, but he would envision only a three- to four- year mission before it departed to explore its next Kuiper Belt target. 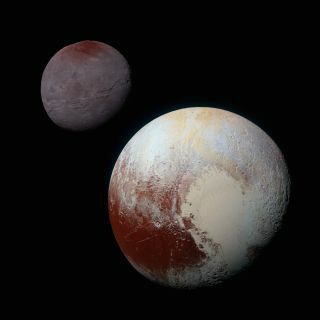 The team plans to continue publishing more of their findings and determining the spacecraft system attributes needed to accomplish a Pluto orbiter-Kuiper Belt mission. "Our team has shown that the planetary science community doesn't have to choose between a Pluto orbiter or flybys of other bodies in the Kuiper Belt, but can have both," Stern said. "Sometimes, you get a free lunch."